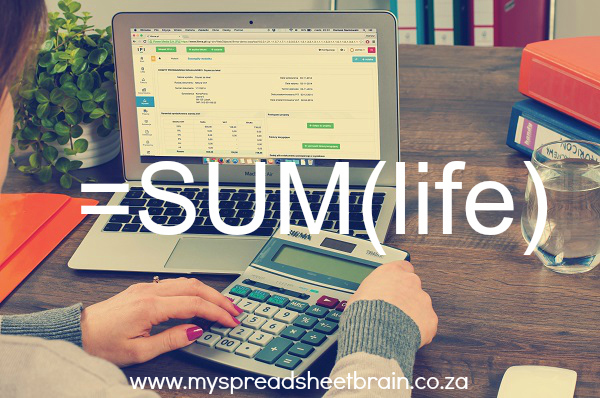 The thing about having a spreadsheet brain is that I want my life to be like that too. You know, ruled and equated by formula; Easily sorted in numerical or alphabetical order; Colour coded at the click of a button. So you can imagine the amount of smoke signals exiting my ears these past few weeks as I said goodbye to a career that I had known for almost 10 years, for something completely different! WARNING! WARNING! UNIDENTIFIED DATA FOUND IN THE SYSTEM! ABORT MISSION! Okay, that might be a tad bit dramatic. But it pretty much summed up my thought process as I bid farewell to the comfortable. Suddenly, nothing made sense anymore. My formulas were not adding up and the sort function had malfunctioned. Nothing was the same! Aaack! Change! Everything’s chaaaanging! Damn you, Stefano DiMera! I will admit (because it’s my blog and I come here to admit things) that it left me straight up rattled. Well, not like someone who is all jittery and on nerve medication. More like, my spreadsheet brain would just not switch off. I analysed everything, researched until I couldn’t anymore and compiled lists in my head. I tried to be strategic about everything, even what I would take for lunch on my first day at the new office. It just got out of hand. And then God, in all His cleverness, arranged for me to have a 1 week breather between the 2 jobs. Talk about a life saver! I could mentally switch off and enjoyed a refresher at the annual Arise women’s conference. I was reminded that HE holds my world in His hands. It is in HIM that I live and move and have my being. All this other stuff is bonus… add ons… instrumental to the bigger picture. But it is NOT the bigger picture. You know? That kinda helped me to keep things in perspective. After a while all the smoke cleared up and I found myself in a place of peace and calmness. So yes, a season is over. And it’s okay for seasons to be over. Sometimes, us human beings get attached to people or things or places or seasons and it’s not healthy. I mean, imagine if the 1st September rolled around and Winter was like, “Oh sorry, Spring, I know that it’s your time now, but do you mind chilling for another month?” (pun oh so cleverly intended). It’s just not natural. That is not how life works. People come and go, things change and life happens. And there in lies the beauty of growth. So tonight, after facing day 1 in my new career, I smile. Even though I got lost like, thrice and no one spoke to me (mainly because I didn’t speak to them) and I had to recall an email I sent to the whole company asking HR when I can go home. I smile because life is not a spreadsheet. There is no generic formula to the perfect life. And whew, what a relief that is!